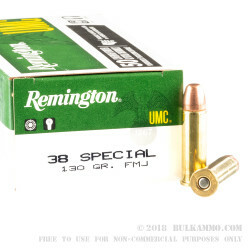 A soft shooting, fun to shoot .38 special ammunition from a reputable maker that has been making it the same way for a long time with great attention to detail and build quality. 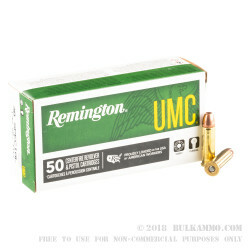 This UMC Remington load is a 130 grain Full Metal Jacketed round that offers 800 feet per second out of the muzzle to keep your enjoyment high and for use with new shooters to break them in on harder to shoot guns like .357 Magnums or lightweight firearms in the .38 Special arena. 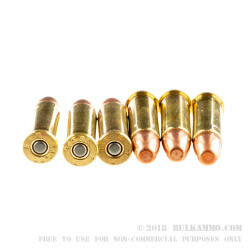 This is a very nice round because it is made well and shoots every time, without a bunch of hiccups or drama. 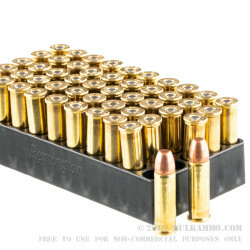 You are not getting poorly sized cartridge cases or nasty smoky powder like you get with range reloads. You aren’t getting a high price like you do with most mainstream producers. You aren’t getting projectile drift in the cartridge while shooting, causing misalignments. What you are getting is 105+ years of innovation, reliable performance and solid engineering as well as a company that knows how to deliver on a product expectation. How many companies are you working with on a daily basis that have been delivering on promises for 105 years?